Fr. Cleofas was the third born in a family of nine. Philip, his father has died. Noella, his mother, is here with us, as well as all his brothers and sisters. Cleofas was a direct descendant of Harisimae, the famous warrior of Rohinari, who accepted the first Marist mission to Malaita and became its protector. Immediately after his ordination, Cleofas was appointed to teach at ‘Apifo’ou College in Tonga in 2006. To prepare him well for this ministry he began further study at the University of the South Pacific in Fiji and graduated in 2009. 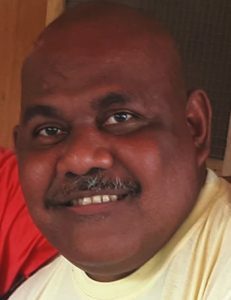 He taught for a few months at St. John the Evangelist Catholic School in Malaita and then was appointed as chaplain and full-time teacher at St. Joseph’s Secondary School, Tenaru. It was there that Cleofas took ill and it was found that he had a brain tumour. We are shattered and at a loss to come to terms with why he was called so early in his life as a priest. The life of Cleofas can be a source of comfort and hope for all of us. I worked with Cleofas in Tonga and I have received messages of condolence from the staff at ‘Apifo’ou College, and from some of Cleo’s classmates at the seminary. Fr. Chris Ganzon SM, the district superior of the Marists in the Philippines, looked after Cleo when he was receiving medical treatment there. Fr Chris said “though he struggled and was finding life difficult, he strove to be with us, to be our brother. He smiled at us even when he was in pain. That is what is remembered by most of us and by those who worked with him. He never complained about his pain”. He is also remembered for his simplicity and humility. He lived very simply and never boasted of anything he accomplished. To the end of his life he lived his Marist vocation to the full. There was a famous Italian composer of opera music named Puccini. At a young age he became ill with cancer. At that time, he was working on his masterpiece, ‘Turandot’, which he never completed. His family and friends mourned the loss of such a young talented composer, but they also wanted to finish what he had started. In 1926 at La Scala Opera House in Milan, Italy, ‘Turandot’ was performed for the first time, conducted by the famed conductor, Arturo Toscanini. When it came to the part of the opera at which Puccini had stopped, the conductor stopped the orchestra, turned to the audience with tears in his eyes and said, “this is where the master ends”. There was complete silence. Then he looked up with a smile on his face and said “and this is where his family and friends took over”. Students of St. Joseph’s, Noella and the family, there is a message here for all of us: Cleo has ended the composition of the music of his life, and it is for us to continue the story of his life – to smile, to be humble and to live simply. May Cleo’s good soul rest in peace.